I apologize for the scarcity of blog posts recently. Somervillain has been pulling his weight, with an excellent ride report the other week, but John F has been busy relocating and I’ve been spending almost all of my bike time on race training. 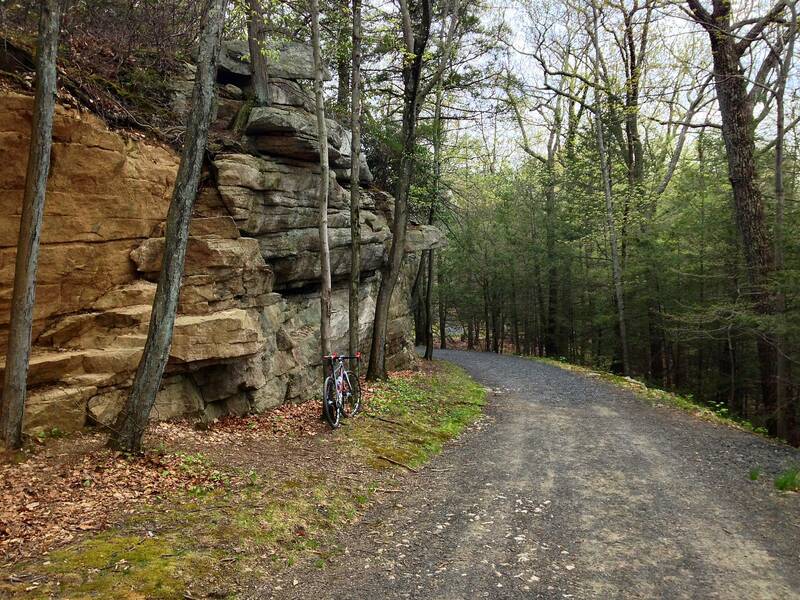 This is a rest week, though, so I got out to wander along the Shawangunk Ridge trails on my cross bike, and enjoy what already feels like late springtime. This year, we seemed to grind gears directly from winter to summer. Now that I’ve lured you in with a pretty picture, I’m going to talk about bike racing again. 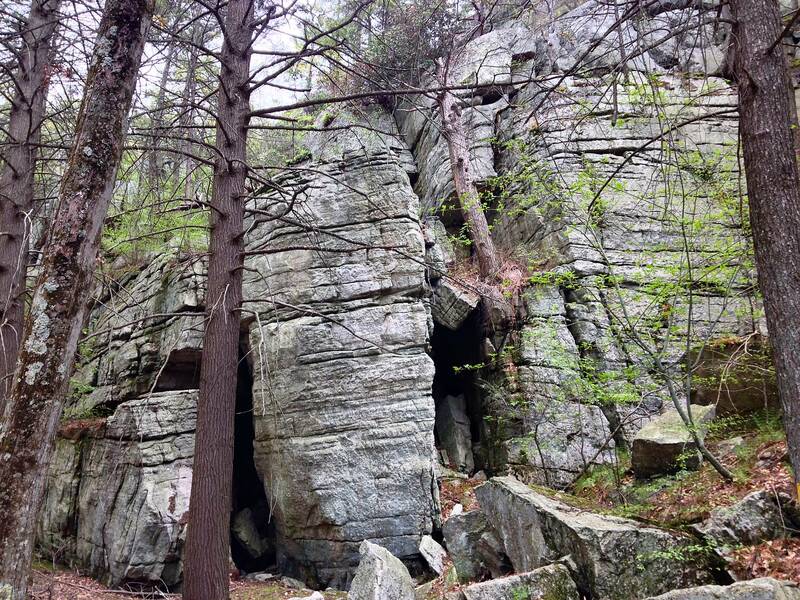 Just for a couple of paragraphs, I promise, then it’s back to pretty pictures of the Gunks. My season couldn’t have started better: a win in my first race, top 10 in a crit the following weekend, then a top 10 at Battenkill. I took a couple of weeks off for work/family reasons, and then a family trip to Panama (we had a great time). Then it was back to training. 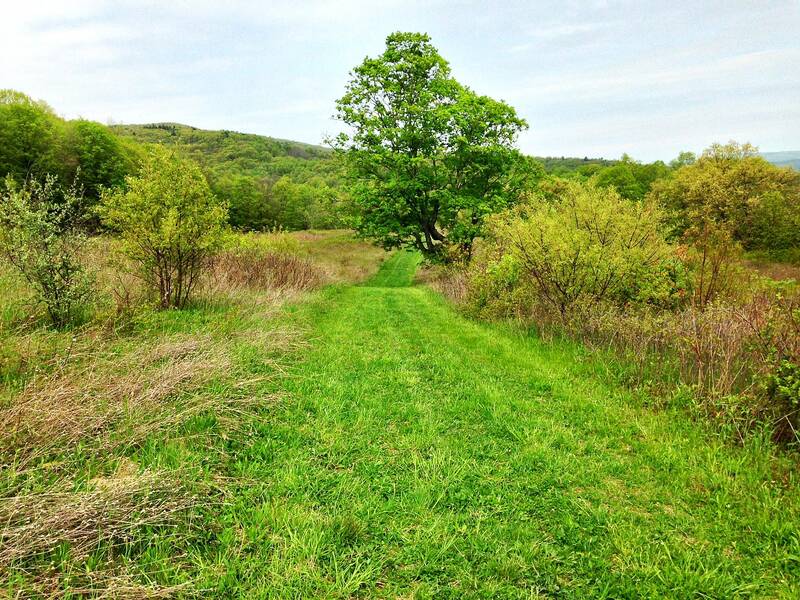 My next race was the Bear Mountain Classic, last weekend, where I failed miserably. Part of it was mechanical, part of it was mental, but most of it was simply physical. The race starts with a 10-minute climb, and I could only hold onto the two race leaders for 9 minutes before completely falling apart. I burned far too much gas too early, couldn’t recover, and ended up quitting the race. The mechanical part was that I had misadjusted my brakes, causing them to rub slightly, but that is such an incredibly lame excuse that it’s disallowed in polite conversation. When you’re dying it always feels like your brakes are rubbing, anyway. The mental part is there were only two racers off the front when I quit, and quitting when 3rd place is on the table (and plenty of paying spots, and upgrade points) is a ridiculous thing to do. But I just felt terrible and didn’t want to race any more. So it goes. I certainly do plenty of climbing (150,000 feet this year so far), but I’m not a climbing specialist. In fact I’m very far from a climbing specialist, which is obvious when I compare my race results against the length of the longest climb in the race. In all races featuring a climb of more than 10 minutes, my best result is 22nd place, with two DNFs (did not finish). In all races where the longest climb is less than 10 minutes, my worst result is 8th place, with five podiums. I’m not a big guy, but I’m 10 pounds too heavy (or 20 watts too weak) to compete in races that are decided by raw watts per kilogram. I might lose the 10 lbs (or gain the 20 watts) someday, but in the meantime I just need realistic expectations about races with long climbs. Which is too bad, since I live in the mountains. But this isn’t a blog about racing in the mountains, right? It’s about riding. And ride I did, today. I rode my cross bike to Spring Farm. 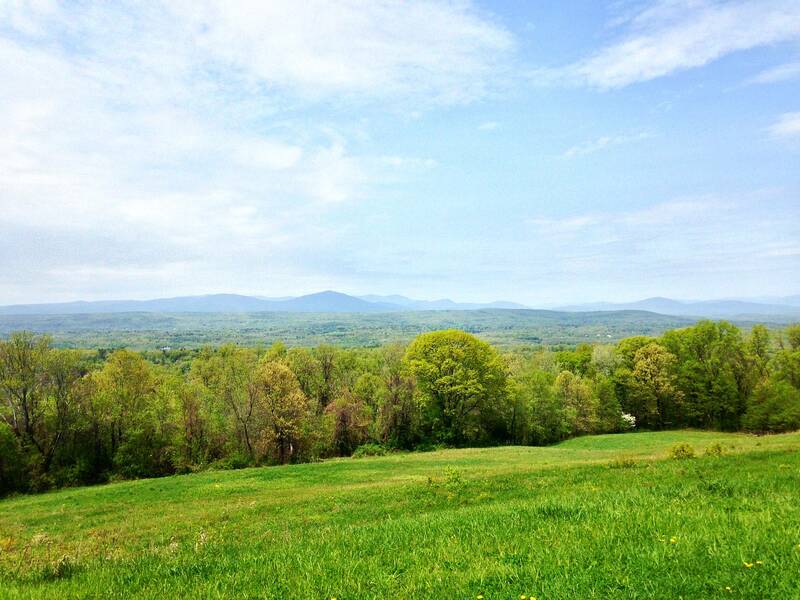 (In the photo above you can see the red barn at Spring Farm, far below.). 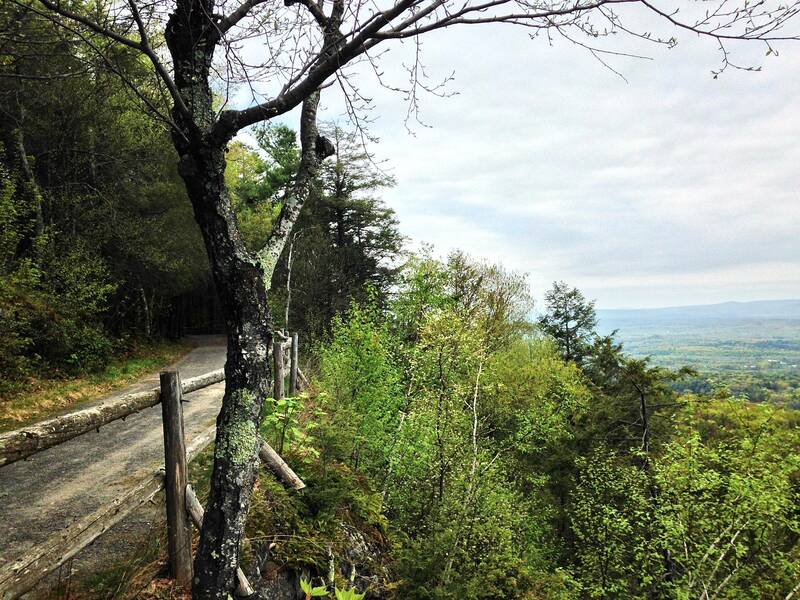 But before I even made it onto the carriage roads, two coincidences occurred. First, the volunteer at the gatehouse was somebody I work with on community/volunteer events, so we chatted about local politics for a while. When I finally got rolling, I almost immediately ran into my son’s 4th grade class, on a field trip to the Algonquin longhouse, where they were grinding corn and throwing spears and such. That’s small town living for you, can’t go for a ride in the woods without running into people you know! Or your kids. I finally got rolling on the carriage roads and worked my way up the ridge, in no kind of hurry, just enjoying the woods and the view. Hey, as long as I’m taking photos of my bike, here are my new brakes. 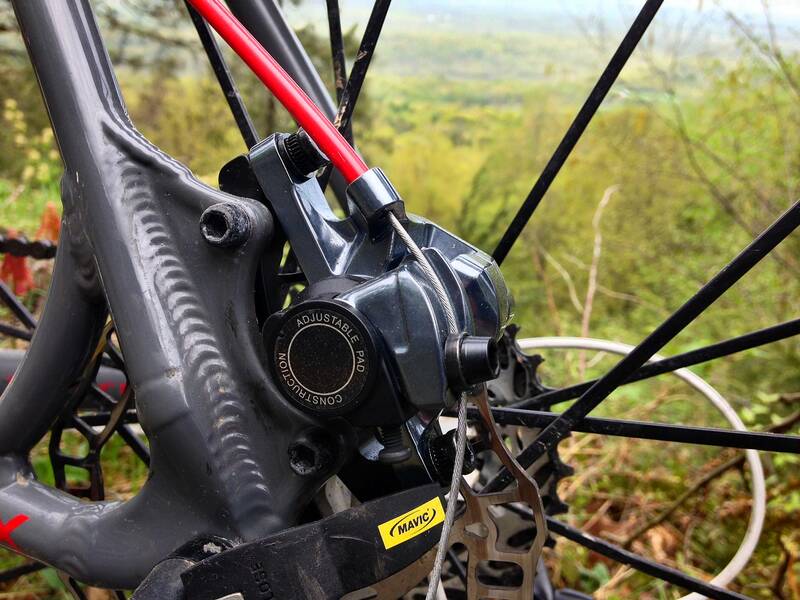 I replaced the Avid BB7 mechanical discs on my cross bike with Shimano CX-77s. The BB7s weren’t broken, they were just clunky and annoying. The old brakes were like an old Dodge Dart that doesn’t have the common courtesy to just die already. The new brakes are like a Toyota Camry, functional and uninspiring. Which is fine. They’re brakes. 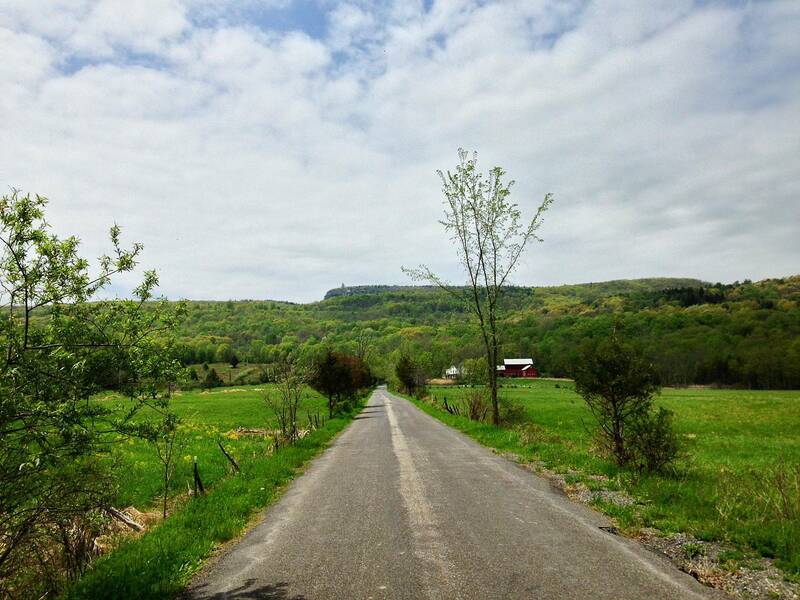 Anyway, I rolled along the ridge for about 2 hours, nice and easy, above and below crags near the Mountain House, through grassy fields on Glory Hill, and finally getting back on the pavement at Pine Road, then home on the Wallkill Valley rail trail. A lovely day for a bike ride. 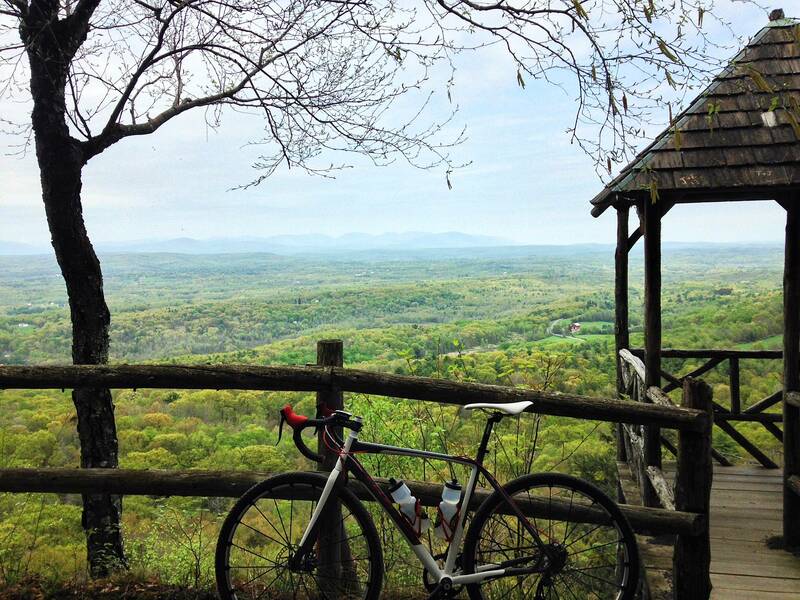 This entry was posted in bicycles routes rides, catskills, Gunks on May 13, 2014 by John Schwartz.